The heated pool at Island Views has a waterfall, and it’s a nice place for those who enjoy swimming. Island Views is located on the waterfront with easy access to nearby water sports. You could walk to three beaches from this villa, taking a grass path to white sand beaches near Pull Point. If you and your friends enjoy snorkeling, that’s available right off the villa. The villa itself comes with most everything you’d need for a simple week’s stay, including air-conditioning in the bedrooms. When you want to play board games while enjoying the weather, or get a little exercise on the fitness equipment, or lounge in the hot tub, this villa is a nice option. Right on the water and within a few minutes' walk of three beaches. Perched on an idyllic promontory overlooking the shimmering Caribbean, “Island Views Villa” overlooks Buck Island and Green Cay and is on the corner of Chenay Bay. This property is at the end of the road of a private community of upscale homes. 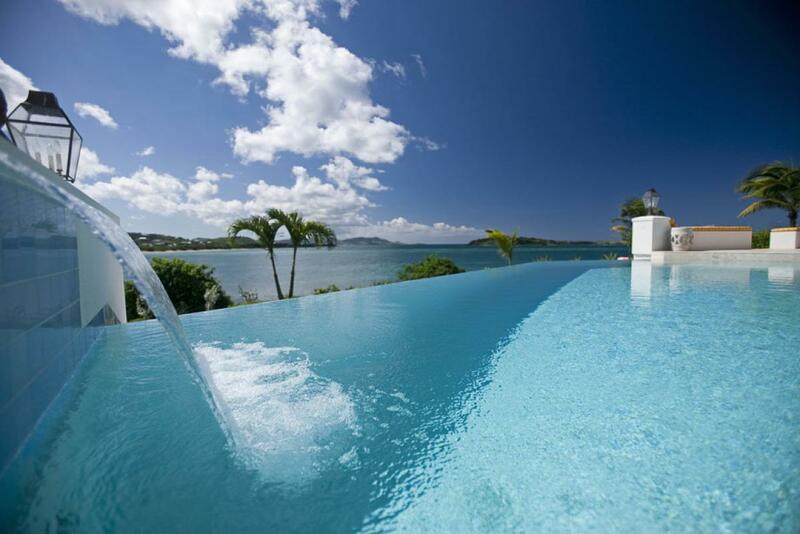 Each room in the house looks out over a different part of the Caribbean. Here, east of Christiansted, you will find a retreat where every detail is taken care of. From this sensational vantage point on the St. Croix north coast you can soak up the year round summer sun and escape from your everyday routine. An early morning work out in the private exercise room, a swim in the infinity pool and breakfast next to the pool could start your day. The pool and deck area offers privacy for those wanting to tan areas not normally seen by the sun. Two retractable awnings oceanside create an oasis of cool on sunny days, and keep you dry and comfortable outdoors when it rains. Island Views Villa blends the outdoors and indoors so that they flow together perfectly. You are never far from the action or the spectacular views whether relaxing on a chaise lounge next to the infinity pool, preparing dinner in the well appointed kitchen or grilling dinner at the gas barbecue built into the outdoor bar. The large master bedroom suite is on the main floor on the east side of the villa. This first floor bedroom and main floor are all accessible by wheel chair. This location makes it a great place for late afternoon naps or for getting ready for an evening out. On extremely warm days the air conditioner quickly cools both the bedroom and bathroom. Take the elegant limestone staircase to the second floor and you will find two comfortable bedrooms. Both are air conditioned for those days when the heat of the day carries over into the early evening. Windows in both bedrooms allow the evening breezes to quickly cool down these spaces once the sun approaches sunset so that not only do you enjoy the refreshing breezes but also the sounds of the surf. This quiet area of St. Croix offers quiet solitude and privacy yet you are just minutes from the restaurants close by in the east end. The upper suites are accessed by stairs; persons who have difficulty climbing stairs may wish to enjoy the Master Suite on the main level, which is wheelchair accessible. Walk to Chenay Bay Beach (step down to water's edge below pool area and walk 100 yards along shoreline), or walk on grass path to two other white-sand beaches near Pull Point, less than one minute's walk each. Good snorkeling right off villa! Welcome Basket of drinks + snacks upon arrival. Two 2-person kayaks and paddle board for guest use are stored at the Chenay Bay Sport Center by special arrangement (a short, 5-minute walk from the villa). The kayaks may be adjusted for single or double use. Guests are asked to please tip $5 to the attendant who helps you get them out onto the water. Life jacket use is also required, and these will be provided.